Courses are designed to give students the practical skills they will need in their careers. Our courses are designed to ensure they provide you with the wide range of skills and experience required to develop successful and meaningful careers as a registered nurse or midwife. Nursing is now an all graduate profession. LSBU’s nursing degrees are accredited by the NMC. As a successful graduate you will eligible to apply and join the NMC Professional Register of Nurses and Midwives. Once registered, you'll be able to apply for any health-related job requiring qualified nurses.. The pre-registration postgraduate diploma in nursing enables graduates from any discipline to gain professional registration in nursing on a fast track two-year course. 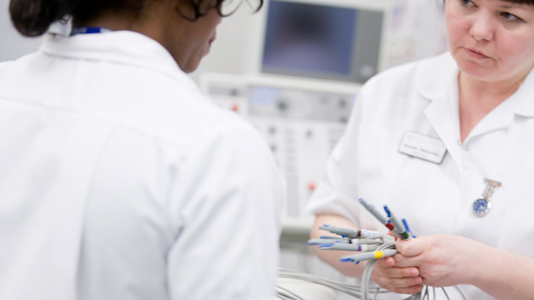 LSBU’s postgraduate diploma in nursing is accredited by the NMC. As a successful graduate you'll be able to apply and join the NMC Professional Register of Nurses. Once registered, you'll be able to apply for any health-related job requiring qualified nurses. Post-registration refers to a registered healthcare professional, who is qualified and is working as a nurse, or midwife. Post-registration courses are only suitable for those who are currently working as a qualified healthcare professional. A qualified midwife gives necessary care, advice and supervision, to women during pregnancy, labour and the postpartum period. They are responsible for overseeing deliveries and the care of newborn babies for the first 28 days of their lives. Find out more about careers in midwifery. Adult nurses care for adult patients suffering from acute and long-term illnesses and diseases. They support recovery from illness or operation by using care plans, carrying out care procedures and assessments. Find out more about careers in adult nursing. Our Continuing Personal and Professional Development (CPPD) portfolio includes a range of flexible programmes, modules, study days, e-learning and bespoke projects that all meet the needs of our service colleagues, underpinned by a robust research and practice-based culture. Our programmes are designed and implemented in collaboration with service colleagues supporting the development of a workforce to lead and innovate into the future. Download the CPPD Frequently Asked Questions Guide (PDF File 293 KB).